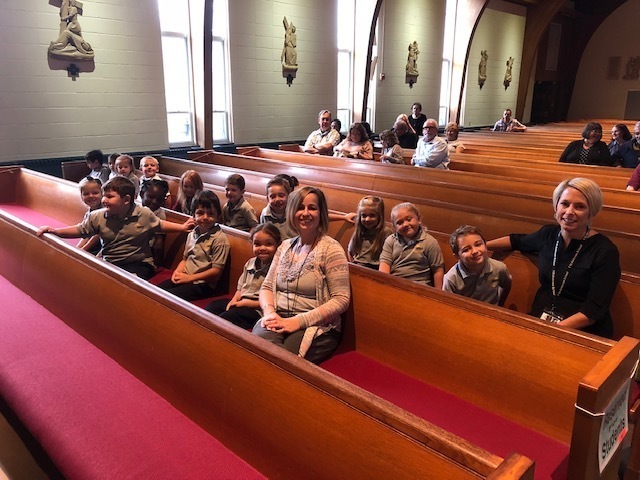 Chances are if you take a walk down the halls of St. Ambrose School, you will hear the kindergarteners singing songs about the months of the year, days of the week or the sounds that the letters make. You may also hear us counting or we may be hard at work learning to print our letters and numbers. We may be trying out our engineering and problem solving skills in a STEM activity, learning the scientific process through hands on experiments or you may just see us having fun on the playground with our friends! Our full day kindergarten combines the rigor of academics with fun, developmentally appropriate activities to make learning meaningful. Our small class size enables us to meet the needs of each child through individual attention, differentiation and a variety of instructional approaches. Our program consists of religion, literacy, math, science and social studies as well as art, technology, spanish, music and physical education. Our kindergarten classroom is a safe environment with clear expectations where our students are provided opportunities for leadership, social interactions and hands on learning. Christian values are instilled daily and are the core of all we do. Our students come to school each day smiling and excited for a chance to learn something new!